You will learn what the Bible teaches concerning success. You will learn how to have good health. You will know how to lose weight naturally. You will learn the importance of giving attention to all six areas of life. You will know how to grow spiritually. You will learn how to improve your marriage. You will know how to raise godly children. You will learn how to gain victory over worry and evil thoughts. You will learn how to make a budget. You will learn how to get out of debt. 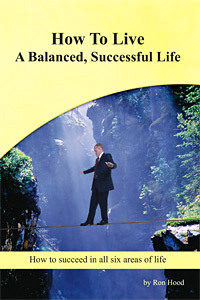 You will learn how to set and reach goals in all six areas of life. You will enjoy the many stories and illustrations. You will know how to avoid the many painful mistakes that others make with their health, family, and finances. I want to express my sincere appreciation to each person who had a part in making this book possible. My wife, Barbara, spent hundreds of hours typing and proofing. She was a great source of help and encouragement. I also want to thank the following people who helped with proofing and who made very helpful suggestions: Andrew and Shari Moffitt, Jonathan and Kristi Hood, James and Suzanne Hood, Samuel Hood, Steve and Rebecca Hoffman, Paul Hansen, Gene and Judy Ball, Irene Sargeant and Brent and Sallie Clement. A special thank you to John and Rose Radank who opened their home to us and let us use their computer while we were ministering in Germany. Fifty percent of this book or more was written while staying in their home in Germany. I also want to thank the wonderful, talented staff at Faith Printing Company in Taylors, South Carolina, especially Juanita Barnett, for all their help, guidance and assistance in preparing and printing this book. I pray that God will use the contents of this book to enable many people to enjoy success and God’s blessings for many years to come.